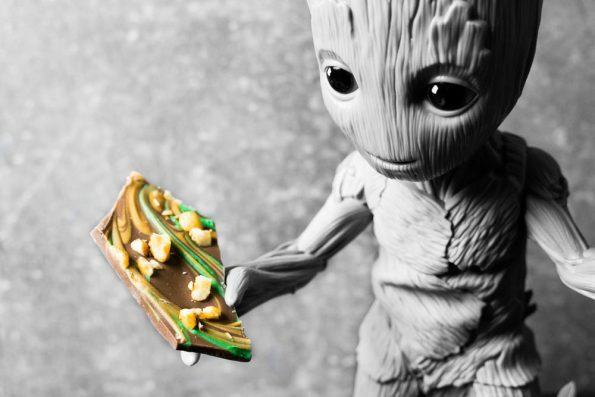 This Groot Bark Recipe is a Paid Promotion for Guardians of the Galaxy Vol. 2. The phenomenon that is Guardians of the Galaxy can’t be denied. After seeing the first movie we couldn’t wait to see the second. Like the vast majority of Guardians of the Galaxy fans, we also fell in love with Baby Groot! Therefore, when we were approached to create a couple recipes for Guardians of the Galaxy Vol. 2’s home release, the first one we came up with, Groot Bark, was inspired by its namesake. The follow up to the smash hit, Guardians of the Galaxy Vol. 2 continues the team’s adventures as they traverse the outer reaches of the cosmos. The Guardians must fight to keep their newfound family together as they unravel the mystery of Peter Quill’s true parentage. Old foes become new allies and fan-favorite characters from the classic comics will come to our heroes’ aid as the Marvel Cinematic Universe continues to expand. The Guardians of the Galaxy Vol 2. has the standard run of bonus features: Deleted Scenes, Gag Reel, etc. However, the star of the show is the Guardians Inferno Music Video. In Guardians Inferno, David Hasselhoff joins some of the cast for disco themed music video. The song performed was written by Director James Gunn and Tyler Bates. Now don’t get us wrong. We really enjoyed the Making Of Featurettes, but the music video really was our favorite. When creating our recipe for Groot Bark, we asked ourselves how we could make a chocolate bark that was interesting and resembled Groot. We started with the colors, the green and dark brown come from chocolate and candy melts, while the light brown comes from peanut butter melts. For texture and a bit of extra salty/sweet flavor we added honey roasted peanuts. This bark is really great as both a snack or dessert. We hope you love our Groot Bark recipe as much as we do! Stay tuned because we have one more recipe inspired by Guardians of the Galaxy Vol. 2 coming! You won’t want to miss our Awesome Mix Trail Mix! Be sure to check out Guardians of the Galaxy Vol. 2 which is now available on Digital HD and Blu-ray! 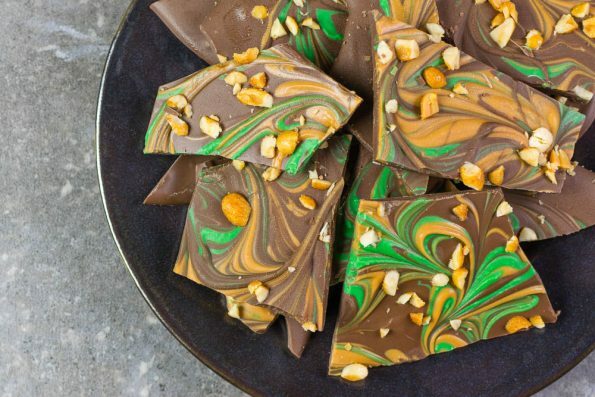 Melt chocolate, green candy melts, and peanut butter candy melts in separate bowls. Spread melted chocolate on a parchment-lined rimmed baking sheet. Drop spoonfuls of melted peanut butter melts and green candy melts on top. Freeze until set, about 1 hour. Break bark into large pieces. *This is a Paid Promotion for Guardians of the Galaxy Vol. 2; We were also provided with an advanced copy for research purposes. Images and title treatments were used with permission from The Walt Disney Company and Marvel Studios. All opinions are wholly our own. View our Disclosure Policy for more info. Awww, Groot was one of my favorite characters! :] These look so pretty!